Dump truck and trailer can haul up to 24 yards of material! 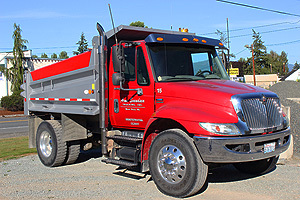 Experienced gravel hauling and road construction experts! We offer road, driveway, and lot grading services! Arne Svendsen Trucking Inc. has been taking care of Skagit County's Hauling needs for over 40 years and running. Arne started the company back in 1975 with only one 5 yard dump truck. Today we have over 5 trucks running crushed rock, pit run, sand, and drain rock to Skagit County, South Whatcom and North Snohomish counties. We also do gravel building pads, gravel roads and driveways as well as the sale and delivery of crushed rock, pit run, sand, and drain rock. Enter the Length, Width, and Depth of the area you need gravel for and get the answer in cubic yards.